Posting a bit late today because I just returned from a conference for work I was at all weekend. Fun but tiring. My image today is of a friend and great guy to work with in Minnesota on this locomotive. 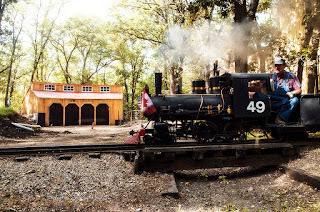 He is operating the Wagner 15 inch scale locomotive and is passing by the new Roundhouse that he has helped a lot with many other people in building. It's going to be great to have a place to store it like that. Up until this is ready it is stored in a shed on the track.